One of the most influential thinkers of his era, H.G. Wells is primarily known for his science fiction writings that looked ahead in time to teach and warn. These novels and stories inspired many filmmakers to bring his visions (if often greatly altered or misfocused) to life on screen. He himself wrote screenplays and closely supervised the production of some of his work. 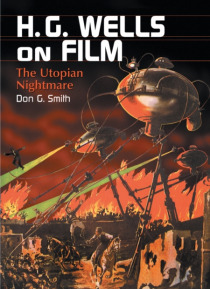 This book is a stud… y of every theatrically released film from 1909 to 1997 that is based, even loosely, on the writings of H.G. Wells, including The Time Machine, The Island of Dr. Moreau, The Invisible Man, The War of the Worlds, The First Men in the Moon, The Food of the Gods and The Empire of the Ants, to name a few. For each film, the author discusses the circumstances surrounding its creation, its plot, how it compares with the literary work, its production and marketing, and its strengths and weaknesses based on aesthetic qualities.